If you are starting the ball in a different direction with every swing then how can you aim? Two way misses don’t give us very much consistency. But once you have a consistent start line then you can work on the amount of curve. 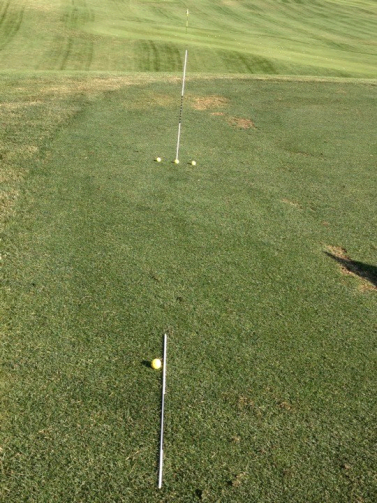 The start line, where the golf ball is starting its flight, is controlled by where the clubface is pointing at impact. So if you want the ball to start right then you had better have the clubface pointed right at impact. But a clubface pointed right, or left, won’t get the ball back to target…it needs a little help from the clubhead path. If the face/path relationship are square to each other than the shot would be straight. Or, the clubhead face and path could be sending the ball straight to the left of target or straight to the right of target depending on the start line. A point to remember is that if the ball is curving it is always away from the path. So, for right-handers, this means that if the ball is drawing right to left then the path the ball started on is to the right of where the ball finishes. Alternatively, the same is true if the ball is fading left to right then the path is to the left and the ball is curving away from that path and finishing at a spot right of where the path started. 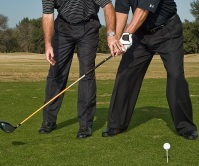 A lot of players get confused however when talking about clubhead path. Their “vision” of it is that the clubhead needs to be moving in whatever direction coming into the ball. However, the reality is the path of clubhead is where it is moving from after impact as it moves forward. The past couple of days I have had players focus on start lines by placing an alignment stick, vertically, in the ground directly between their golf ball and their target. From a square stance, I then ask them to start the ball either right or left of the alignment stick. We don’t talk about swing mechanics when using this exercise, but simply focus on what the hands need to do to effect the clubface for the shot I call out. Once they are controlling the ball start line I will then tell them to make the same swing, but I won’t tell them where to start the ball until they have started their downswing! Now this gets their attention! I am constantly amazed, and so are they, that within a couple of shots they are making the adjustment in swing to control the clubface. Very recently, I had a player that kept telling me he didn’t know where his hands were or what they needed to do. After doing the above exercise, and successfully hitting his start lines, a big smile came across both of our faces. If you don’t know what YOUR hands are doing then try this exercise and I guarantee you will soon! Author of several national golf articles for Golf Magazine, Golf Digest, Golf Tips, etc. 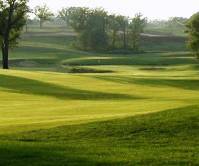 Missouri has been kind to golf enthusiasts by sprinkling charming courses throughout the state. 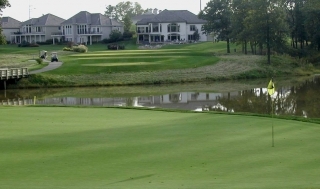 One of the more scenic golf clubs in the Kansas City area is Tiffany Greens, which has been voted as the No. 1 course in the Northland. Located on NW Tiffany Springs Parkway, this course is a gem right near the airport. Tiffany Greens earned its stripes as the former home to the Champions Tour and the TD Waterhouse Championship, which the club hosted until 2003. This par 72 course features lush zoysia fairways and tees, as well as manicured bent grass greens. The soothing landscape offers quiet moments of reflection and gratitude. Indeed, Tiffany Greens contrasts the busy and palpably urgent office chatter which animate the business hours of many of the course’s players. Tiffany Greens was designed by Robert Trent Jones II and has hosted the PGA section championships, college regional finals, high school championships, celebrity tournaments, hall of fame tournaments, and dozens of fundraisers featuring some of the top companies in the Midwest. Recently, the Northland club added one of Golf Magazine’s top 100 instructors: Chuck Evans relocated his Medicus Golf School onsite. Golfers visiting Tiffany Greens have the opportunity to experience the signature challenge right from the outset. The waterway separates the fairway from the green, presenting an idyllic scene. Ironically, this beauty is contrasted with danger. A player must artfully navigate through this difficult stumbling block from the very first hole. With a well-placed tee shot, players can bail out to a stretch of fairway on the opposite side of the water or go for the green. If reached in two, a routine two putt will deliver an opening birdie. Of course, a wet ball will likely deliver a bogey or something even worse. If you can make it through that first hole, there are other challenges that await, but perhaps the most memorable will come as you start the back nine. The Tenth hole is a longish par 3, measuring 188 from the tips, but the green is surrounded on three sides with water. More than one shot has landed on the firm green and rolled off into the water. Try to play it safe away from the water and bunkers await. Land in there and then you face a scary sand shot with water lying inches off the putting surface behind the flag. per player depending on date and time. Try booking online where Tiffany Greens offers up to a 24 percent discount for players. While online you can review weather and climate forecasts, an important feature for those traveling into the city from out of town or for planners coordinating special events such as golfing lessons, weddings, or corporate outings. “Our clubhouse features a fully stocked golf shop, full service restaurant & pub, banquet facilities to host weddings & parties of any size, corporate golf outings any day of the week, locker rooms, and club storage,” says Zadalis. The clubhouse is a 26,000 square foot building. Additionally, Tiffany Greens offers state-of-the-art golf carts that feature GPS Prolink computerized yardage/scoring systems.